David is another very new friend. I’ve known him for less than a year. He tried out for Vilification Tennis at this year’s amateur show. He didn’t make it into the cast because I only have room for one person this year but we did invite him to be a part of Fearless and that has proven to be a great choice. I have so much respect for anyone who tries out for Vilification Tennis through the amateur show. It’s about the scariest possible proposition I can think of to try out for a show in front of a live audience. It’s a lot like American Idol without the slightest possibility of achieving any kind of celebrity. David is well-known in geek circles as Captain America. He’s got the look and the costume and he clearly exercises a lot more than I do. As a part of Fearless, he’s been willing to jump into just about anything we need him to do. 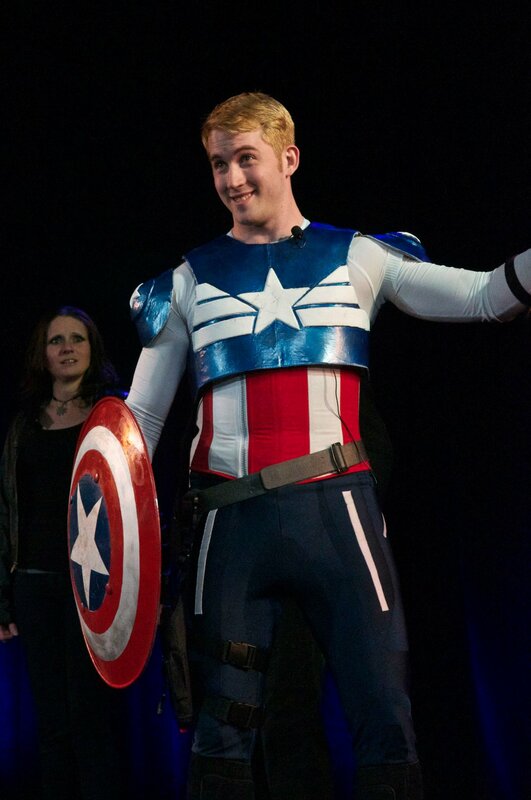 When we wrote the halftime show for CONvergence this year, we decided to plug Captain America into the show because we had the perfect Captain America. His small role underwent a whole lot of changes between first draft and final staging and he was a complete pro about all of it. As a producer, it is great to have people who you can plug into a small but important role and know that they are going to rock it. There are a lot of people who try out for Vilification Tennis and only a few make it into the cast. The ones who don’t make it into the cast are typically pretty gracious and I don’t see much of them ever again. The cool thing about Fearless is we have an opportunity to bring some of those new people with us into other performing opportunities. I’m really glad that we made that decision because it has allowed me to get to know David a lot better over the last few months.